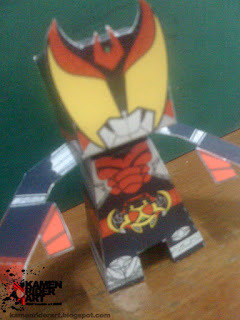 This paper toy is the Kamen Rider Kiva, based on the manga / anime Kamen Rider Series. The papercraft is created by Azrael. Kamen Rider Kiva is the primary protagonist and eponymous character of the 2008 Kamen Rider Series, Kamen Rider Kiva. Kiva is a title passed down through generations in the loyal Fangire family from parent to child.